Take advantage of its spacious inside auditorium for important conferences. Our philosophy is based on an environment without any formalisms or strict etiquette. • Panorama Lounge Bar on the Sky Deck –floor to ceiling windows. • Open Lounge on the Moon Deck –stargazing in total comfort. • New Sun Deck –highest viewing point on board. • Completely renewed Fitness Center –meeting customers’ lifestyle demands. 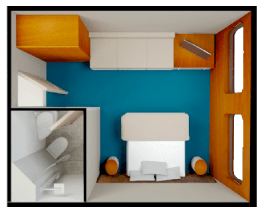 • New Legend Balcony Suite –with more space to set you free. • Even bigger Balcony Suites –become one with the landscape. 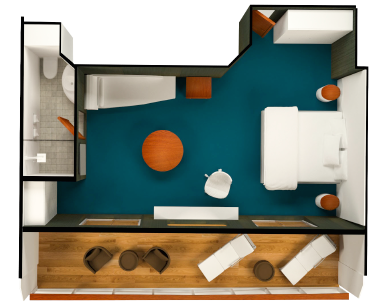 • 8 Completely new Balcony Suites –a grand total of 16. • Big family? 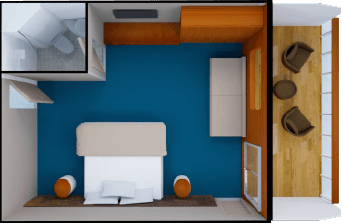 –New Quadruple Suites available. • 750 m2 (8073 ft2) of open decks for a better contact with the islands. The facilities focus on both mind and body and provide you with those special places you need to exercise, rest or relax in a peaceful , harmonious setting. The exceptional cuisine is comparable to that of the best restaurants in the world and merit special mention, ranging from the impressive breakfast buffet with freshly baked bread to the extraordinary menus drawn up by professional chefs for lunch and dinner. Visitors will enjoy local gastronomy, a wide variety of exotic fruits and the world’s best flavors, special menus for children, delicious vegetarian dishes or meals for those who have special diets. Once a week, there will be a barbecue at sea so you can sail, dine and enjoy islands landscapes. Enjoy a charming casual marine décor, with accommodations in cabins with a view of the sea, delicious meals, 2 daily excursions to a habitat unlike any other, full of wildlife that have no fear of man. See prehistoric iguanas, giant tortoises, exotic birds and plants and beautiful landscape of volcanoes, lava cones and magma flows. Snorkel or dive along untouched beaches with a unique underwater world. Tours and lectures provided by licensed nature guides in various languages. To relax in the sun or even bathe in the Jacuzzi, head to the Earth Deck, where the natural wonders of the Galapagos can be enjoyed from a whole different perspective, whether by the handrail of their decks, the comfort of a sun-lounger or from the balcony at the bow. There’s a space for everyone on these deceptively large yachts. Take a peak into our boutique for your shopping needs. On our new Sky Deck, view the dolphins playing in the water, swim in our pool, watch the wave from our panorama lounge inside with a drink from the Fisherman bar. Enjoy the various activities on board. Enjoy our high-class gym. On board our ship, nights are magical, full of bright stars and countless constellations. All of our highly-qualified multi-lingual naturalist guides are certified by the Galapagos National Park. On visits to the islands, they will accompany you every step of the way, taking time to explain the highlights as you wonder through this new and magical land. Every evening, these same guides will give you a lecture illustrated with multimedia presentation, imparting and sharing with you their knowledge of geology, history, evolution, flora and fauna of the islands. Also enjoy our library and for the little ones kid's corner where they can learn all about the Galapagos! Departure from Quito or Guayaquil to Baltra (2 ½ hours flight). Passengers are picked up at the airport by our naturalist guides and taken on a ten minute bus drive to the pier to board the Galapagos Legend. Dry landing. Walk by a brackish lagoon to see flamingos. The trail leads across typical dry zone vegetation. Keeping up until Dragon Hill, see an important nesting ground for endemic land iguanas, offering lovely views of the anchored boats and neighboring islands. The forest is home to mockingbirds, Darwin’s finches, yellow warblers, and Galapagos doves. Dry landing on Galapagos’ largest island where we will learn about the eruption of the five volcanoes that form it. The trail leads to Darwin’s salt-water crater Lake and excellent views of lava fields and volcanic formations. We will return by the same path for a dinghy ride along a shoreline full of marine wildlife, where we will admire a variety of seabirds*, such as Blue-footed Booby, Brown Noddy, terns, Flightless Cormorant and depending on the season, a large number of Galapagos Penguins* which are only 35 cm. tall; the only penguin species in the world to extend its range into the northern hemisphere along the equator. They are monogamous and lay their eggs in small cracks of lava, on the lower parts of the island near the shoreline not reached by the ocean waves. The population of penguins on the islands is about 2,000 individuals, most of which live on this western portion of Isabela; others are scattered further south on the island. We will have an opportunity to snorkel in deep water. Graffiti believed to have been left by19th-century pirates is a curious reminder of an intriguing past. Dry landing. From Espinosa Point, is possible to admire a wide view of Isabela Island across the Bolivar Channel, an area that boasts some of the highest diversity of endemic sea fauna in the Galapagos. Here the largest, most primitive-looking marine iguanas are found mingling with sea lions and Sally Lightfoot crabs. Fernandina displays a wonderful opportunity to encounter flightless cormorants at their nesting sites, Galapagos penguins and the “King” of predators on the islands, the Galapagos hawk. Pa-hoe-hoe and AA lava formations cover the majority of Fernandina terrain. Vegetation is scarce inland, with few brachycereus cacti. In the shore mangrove can be found. Dry landing on the northern part of the Islet. The walk begins with an impressive cactus forest surrounded by land and marine iguanas; as we reach its highest point, be on the lookout for tropicbirds, a Nazca and blue-footed boobies, swallow-tailed gulls. In South Plaza there is a large colony of the smaller sized land iguanas. The population is approximately 300 individuals. They feed on all kinds of vegetation, but during the dry season survive on the fruits and flowers of Opuntia cacti. Due to their proximity with marine iguanas, this is the only place on Earth where we will find the Galapagos hybrid iguana. Wet landing followed by a high intensity hike on rocky terrain. The trail includes an olivine beach of 90 meters long and a path that climbs to the top of a volcanic tuff, through several magnificent viewpoints. This is probably the only site where the three booby species of the Galapagos can be seen together, as well as two species of frigatebirds and a sea lion colony; it is also excellent for dinghy rides and snorkeling, where a good range of sea birds can be observed. Dry landing in Puerto Baquerizo Moreno. Passengers visit the San Cristóbal Giant Tortoise Breeding Center to learn about the National Park’s conservation programs. Enjoy a beautiful landscape on the way to the Reserve. Passengers will also have the opportunity to visit the port village, have a drink or shop for arts and crafts and other souvenirs. After the visit you will go straight to the airport for return flight to Guayaquil or Quito. Wet landing on a beautiful white coral sandy beach guarded by a colony of sea lions. There are no trails, so we stay along the shore where we can spot Galapagos hawks, American Oystercatchers, Galapagos Ground Doves, Hood mockingbirds, Yellow Warblers, lava lizards, marine iguanas, and three species of Darwin’s finches: a subspecies of the Large Cactus Finch, which is similar to the large ground finch, the Small Ground Finch (Geospiza fuliginosa) and the Warbler Finch (Certhidea Olivacea), another endemic subspecies. Swimming and snorkeling offer a great variety of the Galapagos’ marine wildlife: king angelfish, Creole fish, damsel fish, parrotfish, manta rays, and white-tipped reef sharks. Dry landing. An island of geological interest, we explore volcanic formations and a riveting wildlife: large sea lion colonies and seabirds including the Española mockingbird, Nazca Boobies, and the spectacular Red-billed Tropicbird. You will also encounter marine iguanas, lava lizards, and the colorful Sally Lightfoot Crabs. A somewhat lengthy hike will bring you among Nazca and Blue-footed Boobies, right up to nesting grounds that sometimes overlap the trail. Other birding favorites include Galapagos Dove, Galapagos Hawk, Swallow-tailed Gulls and the world’s largest colony of Waved Albatross, an unequivocal highlight during mating season (May-December). Admire the island’s dramatic backdrop, featuring the famous “Soplador”, a seaward blowhole that shoots up water up to 23 m (75 ft) in the air. Dry landing. We visit the Station where the Galapagos giant tortoise breeding program takes place as part of our efforts to preserve the fragile Galapagos environment and where the famous Lonesome George (the last surviving specimen of his species) lived for decades. Admire a prickly-pear cactus forest and variety Darwin’s finches and other land birds. The Darwin Station also works providing environmental education to the communities, schools, and tourists visiting the Galapagos Islands. You will also have some free time to visit the town and shop for souvenirs. Great opportunity to observe giant tortoises in their natural habitat. Lava tunnel formations are the result of the many eruptions that have occurred throughout history. In the Scalesia forest, Vermilion Flycatcher, Short-eared Owls, and several finch species can be spotted. Wet landing. Ballena (Whale) Bay is a beautiful green sand cove at the base of Dragon Hill on the west coast of Santa Cruz Island. The beach* contains plenty of olivine crystals of volcanic origin. The crystals were formed when the magma was still underground. The content is magnesium, iron, and silica. A small population of tortoises from Pinzón Island lived at the site but were probably taken by whalers or previous inhabitants. Opportunity to see marine iguanas* and sea birds* followed by snorkeling. Departure from Quito or Guayaquil to San Cristobal in a 2-hour flight. Upon arrival, passengers are picked up at the airport by our naturalist guides and taken on a ten-minute bus drive to the pier to board the Galapagos Legend. We recommend that passengers be in reasonably good physical condition as some trails are difficult therefore elderly or disabled people may find them too hard. The passengers with difficulties must notify us about their physical condition in order to make the necessary arrangements. Wereserve the right to refuse a passenger if someone failed to inform of any physical disability, or who in the opinion of the company, constitutes a danger to themselves, other guest, members of the crew, or the smooth operation of the vessel. On a dry landing, passengers step directly from a dinghy to rocks or onto a dock. We recommend: walking shoes, sunscreen, hat, water, insect repellent and a light jacket. Wet Landing means that the dinghy edges up onto a beach, where you step into knee-deep water assisted by crew members and guides. We recommend: swimming suit or shorts, walking shoes or slippers, towel that will be provided by the crew while disembarking, sunscreen, hat, insect repellent, plastic bag, well insulated cameras and a windbreaker. It is forbidden to smoke inside the yachts or the vessel. Smoking is allowed ONLY on the sun decks. Upon arrival, a bill will be opened for you. If you wish to pay with your credit card, we ask you to come to reception to sign a voucher and to make copies of your passport and credit card. Authorizations take about 48 hours, so please do this on your first cruise day. We accept all main credit cards: Diners, Visa, Mastercard , American Express. Travellers Checks, Euros and US Dollars are also accepted. What would happen if I get seasick? We hardly get a seasick passenger on board. However, we have seasick medication on board all our ships, but if you are particularly sensitive you can bring your own medication. The tap water is generally not safe to drink in Ecuador. Bottled water is readily available at tourist sites, hotels, and restaurants. On board our yachts you will find bottled water in your room. Ice used onboard the yachts is generally made with purified water as well. The Legend has 52 ocean view, air-conditioned cabins plus 3 interior ones, each cabin counts with lower beds and private facilities in which a matrimonial, double, triple or quadruple options are available. 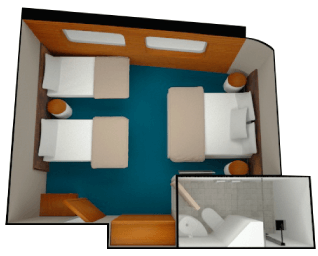 We have suited a new cabin configuration to assure enjoyment for families and friends traveling together. 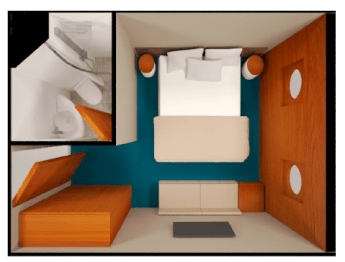 Each cabin includes: hair dryer, special bedding, and updated furniture. Internal, local and international satellite telephone service is offered, Internet is accessible when anchoring in main islands. Voltage is set for 110-220 volts/60 Hz. The Balcony suites have private balconies and panoramic windows to immerse yourself within the vast landscape that you are about to witness and enjoy it privately. The Junior suites have three meters of panoramic windows to enjoy the scenery. We have upsized and renamed our biggest and most comfortable cabin; our new Legend Balcony Suite; including a generously large balcony, perfect for sophisticated & distinguished clientele. One of the most striking aspects of our refurbishments: 16 totally new Balcony Suites, located on the Sky Deck and Moon Deck, measuring an average of 23 m2 (248 ft2), including a huge significant redesign and general upgrades to more than satisfy customers´ expectations. 8 Balcony Suites on the Moon Deck. Panoramic view windows + private balcony. 4 New Quads are available ensuring that your whole family can rest comfortably. Enjoy the perks of having the family together in private quarters while cruising the Galapagos Islands. 2 Panoramic windows on each cabin. 24 Double or Triple Suites (Average Area: 15 m2 / 161 ft2). 4 Quadruple Suite (Average Area: 20m2 /215 Ft2). Top of the line amenities. Located on the Sea Deck & the Earth Deck.